Snow started falling on the Glenshane Pass on Thursday afternoon. An image taken from a traffic camera on the Glenshane Pass shortly before 2pm on Thursday showed falling snow lying on the road and hard shoulder areas. The Glenshane Pass is a busy stretch of road used by many people travelling between Londonderry and Belfast. 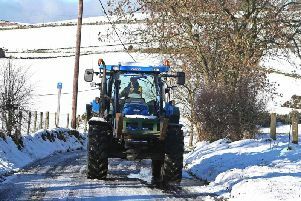 The snow fall comes after the Met Office upgraded its snow and ice weather warning for Northern Ireland. The latest weather warning is for heavy snow right across the North from Friday through to Sunday. Storm Caroline which is moving in from the North brings with it bitterly cold air from the Arctic which in turn results in snowfall. "With cold air in place, a spell of snow looks likely to develop on its northern edge. 1-5 cm is possible quite widely, and up to 10 cm in places. Over higher ground, 20 cm is possible in a few places. There is currently a good deal of uncertainty over the precise track of the areas of rain and snow," reads the warning on the official Met Office website.